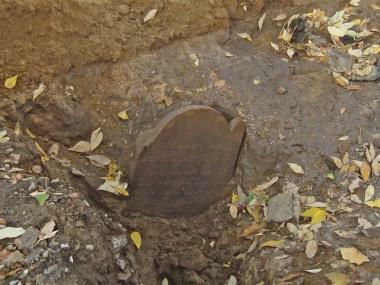 A tombstone from 1799 was unearthed in Washington Square Park on Oct. 23. GREENWICH VILLAGE — A tombstone from 1799 was uncovered at Washington Square Park last Friday during renovations at the site, leaving local historians on a quest to find out the identity of the grave's owner. The headstone was preserved very well, according to the New York Times, with an inscription that clearly reads: "Here lies the body of James Jackson who departed this life the 22nd day of September 1799 aged 28 years native of the county of Kildare Ireland." Washington Square Park was previously a potter's field, which is a burial ground for bodies that are not claimed by anybody. Jackson's gravestone was uncovered just two-and-a-half feet below the ground, but his body was not recovered. Now, local historians, led by the New York Historical Society, are on a journey through time to find out who Jackson was. "They're going to try to unravel the mystery of James Jackson and how the headstone came to be there," Parks commissioner Adrian Benepe told Gothamist. Benepe said archeologists are also trying to find his remains. A man named James Jackson lived at 19 East George Street, which is the former name of Market Street, according to the New York Historical Society. City death records list Jackson on Sept. 23, 1799 and indicate that he was a watchman. In another city directory, though, he is listed as having been a grocer. "There are many fewer Jacksons than I would have expected in the directory," Joan H. Geismar, the archeological consultant who discovered the headstone, told the New York Times. "Chances are this is him."